Scientists now have the first clear picture of what lies beneath sunspots, enigmatic planet-sized dark areas on the Sun's surface, and have peered inside the Sun to see swirling flows of electrified gas or plasma that create a self-reinforcing cycle, which holds a sunspot together. The new research, gathered from the Michelson Doppler Imager (MDI) onboard the Solar and Heliospheric Observatory (SOHO) spacecraft, will deepen understanding of the stormy areas on the Sun in which sunspots appear. Vast explosions associated with these active magnetic regions occasionally affect high-technology systems. Sunspots have fascinated people since Galileo's observations of them contradicted the common belief that heavenly objects were flawless. Sunspots remain mysterious because at first glance, it seems they should rapidly disappear. Instead, they persist for weeks or more. "They obey what is a fundamental finding of observational science: Anything that does happen, can happen," said Philip Scherrer of Stanford University, Palo Alto, Calif., Principal Investigator for SOHO's MDI. "We now have a hint at 'how.'" Astronomers know sunspots are regions where magnetic fields become concentrated. Yet, anyone who played with magnets as a child has felt how magnetic fields of like polarities repel each other. The strong solar magnetic fields should naturally repel each other also, causing the sunspot to dissipate. In fact, observations show that surface material clearly flows out of the spots. Alexander Kosovichev and Junwei Zhao of Stanford University and Thomas Duvall of NASA's Goddard Space Flight Center, Greenbelt, Md., used MDI's unique ability to look just below the sunspot's surface and clearly observed inward-flowing material for the first time. The Astrophysical Journal published their research August 10. "We discovered that the outflowing material was just a surface feature," said Zhao. "If you can look a bit deeper, you find material rushing inward, like a planet-sized whirlpool or hurricane. This inflow pulls the magnetic fields together." 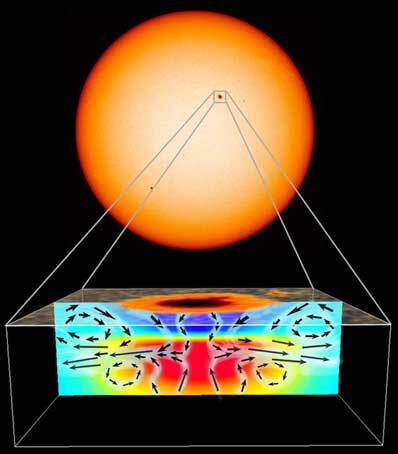 Solar astronomers have long known that the intense magnetic field below a sunspot strangles the normal up-flow of energy from the hot solar interior, leaving the spot cooler and therefore darker than its surroundings. The suppression of the bubbling convective motions forms a kind of plug that prevents some of the energy in the interior from reaching the surface. The material above the plug cools and becomes denser, causing it to plunge downward at up to 3,000 miles per hour, according to the new observations. That draws the surrounding plasma and magnetic field inward toward the sunspot's center. The concentrated field promotes further cooling, and as that cooling plasma sinks it draws in still more plasma, thereby setting up a self-perpetuating cycle. As long as the magnetic field remains strong, the cooling effect will maintain an inflow that makes the structure stable. The superficial outflows seen right at the surface are confined to a very narrow layer. Since the magnetic plug prevents heat from reaching the solar surface, the regions beneath the plug should become hotter. A June 1998 observation provided evidence for this also. "We were surprised at how shallow sunspots are," said Kosovichev. Below 3,000 miles the observed sound speed was higher, suggesting that the roots of the sunspots were hotter than their surroundings, just the opposite of the conditions at the surface. "The cool part of a sunspot has the shape of a stack of two or three nickels," he added. "The cool downward flows dissipate at the same depth where the hot upward flows diverge," said Duvall. "With these data one cannot get a sharp enough picture to really explain the details. Until now we've looked down at the top of sunspots like we might look down at the leaves in treetops. For the first time we're able to observe the branches and trunk of the tree that give it structure. The roots of the tree are still a mystery." MDI explores beneath the surface of the Sun by analyzing sound-generated ripples at its surface using a technique called acoustic tomography -- a novel method similar to ultrasound diagnostics in medicine that use sound waves to image structures inside the human body. SOHO continues to mark an era of successful partnership between the European Space Agency and NASA within the Solar Terrestrial Science program.